Since FOI was established in 1997, hundreds of Orthodox Christians from all over the world, and friends from other Christian confessions, have taken part in pilgrimages which celebrate the history of our faith in the Celtic lands. FOI began with a pilgrimage to Iona marking the fourteen hundredth anniversary of the repose of Saint Columba, the patron and protector of our organisation. From that time onwards, it has been our prayer that God's will should be done on the island where Saint Columba founded his famous monastery. Many of our friends and supporters share the dream that one day, there will be a more permanent Orthodox Christian presence on Iona. As the holy men and women of the Celtic lands are more widely remembered and venerated in the Orthodox Christian world, we also humbly aspire to make a contribution to this process of rediscovery. Our prayerful hope is to increase understanding of these great Confessors and Martyrs of the undivided Church and help Christians to learn about and visit the places which were sanctified by these early heroes of the faith. For general enquiries, please feel free to contact us either on the contact page or at OrthodoxIona AT gmail DOT com. 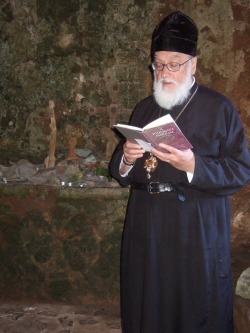 Metropolitan Kallistos of Diokleia is the Chairman of FOI and has led many of our pilgrimages to places ranging from Donegal to Jerusalem, as well as Iona. A more detailed biography can be found ​here. Our patron is His Eminence Archbishop Gregorios of Thyateira.